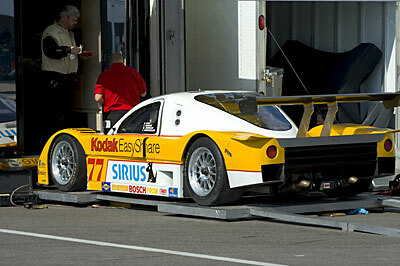 These are random images from the Rolex Test held at Daytona International Speedway, January 5-7, 2006. 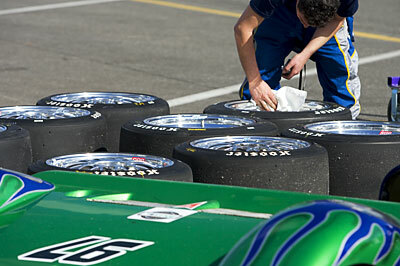 This test is in preparation for the Rolex 24 Hour race held at the speedway January 26-29, 2006. Through a continuing association with Hella, myself and the Motorsports Manager from Hella do the lights on the cars. Hella provides the lights to the teams, they installed them based on our guidance and at the track, we provide spares, technical assistance and aim the lights properly. 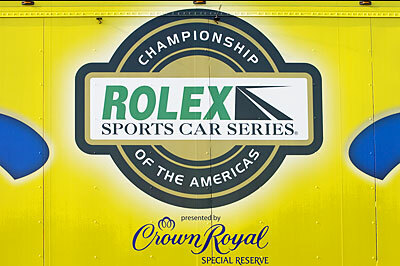 The Rolex is a part of the Grand American Road Racing series. 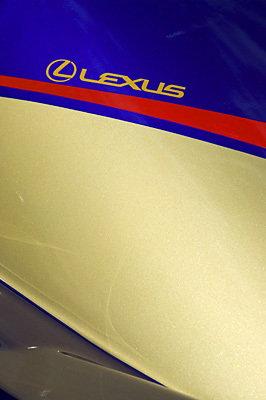 We also do most of the cars running the American LeMans Series. 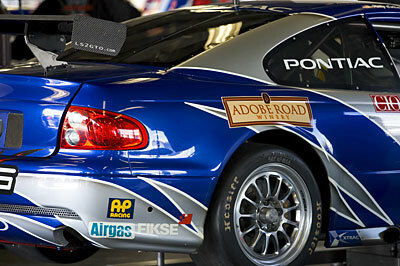 For ALMS we'll provide support at the Mobil 12 Hours of Sebring and at the Petite LeMans at Road Atlanta. 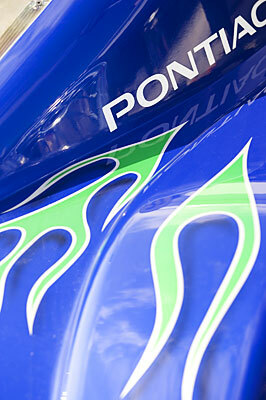 The graphic on the side of the Grand Am trailer. In the garage - the Stevenson Motorsports Stevenson Automotive GT Corvette entry. Drivers of record are Tommy Riggins, Vic Rice and John Stevenson. On the scales - the Doran Racing Kodak/Feeds the Need DP Ford Doran entry. Drivers of record are Harrison Brix, Forest Barber, Michel Jourdain and Terry Borcheller. 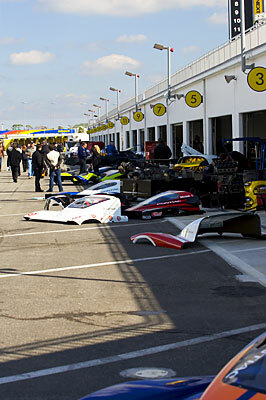 Garage row between test sessions. More expensive carbon fiber than you've ever seen in one place before!! Polishing the wheels - The #97 CyberSpeed Racing DP Pontiac Riley entry. Drivers of record are Skip Cummins and Tony Ave. My hope is they find more drivers before the 24 Hour. In the garage - the Team TRG TRG/iRise #64 GT Pontiac GTO.R entry. Drivers of record are Paul Edwards, Kelly Collins, Jan Magnussen and Andy Pilgrim. A second Pontiac GTO.R entry, #65 sponsored by TRG, F1 Air, Alpine Bagel and iRise, will be driven by Andy Lally, Marc Bunting, R J Valentine and Johnny O'Connell. Parked - the #86 Team Synergy Racing Microsoft/Who's Calling GT Porsche. Drivers of record are Don Kitch Jr, Chris Pennington, Don Gagne and Chris Pallis. 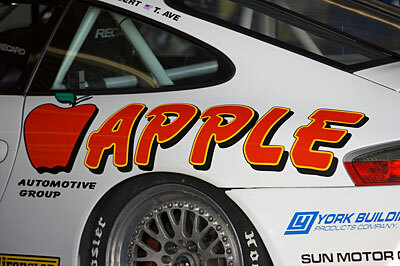 In the garage - the Team TPC Racing Apple Automotive Group GT Porsche. This is the #93. There is also a #92. Both will be driven by Gary Stewart, Rob Stewart III, Dave Stewart, Bob Gilbert and Tony Ave. With two entries, they're likely to finish one of 'em.